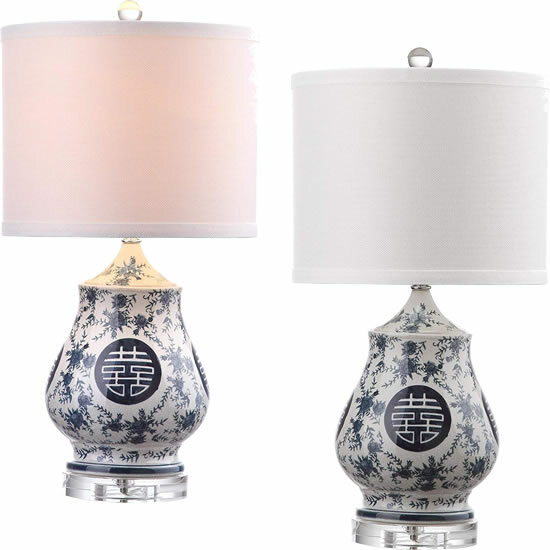 Each hand-painted lamp is unique and may feature subtle variations in color and pattern. 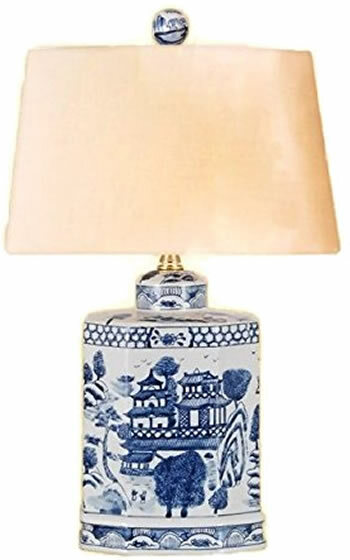 This exquisite porcelain table lamp looks great in a living room or bedroom, and is perfect for traditional or Asian-themed decors. 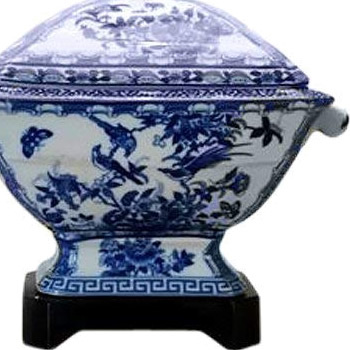 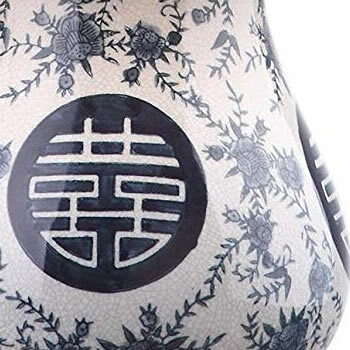 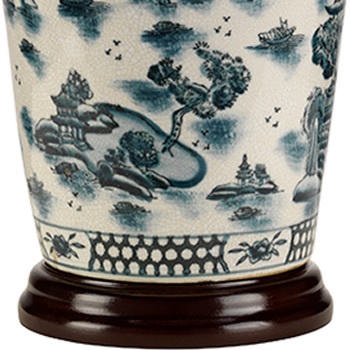 It features a wine urn porcelain base decorated with the image of 13 Hang which were western trading offices located in Hang Kong Harbor during the Chinese Qing Dynasty period. 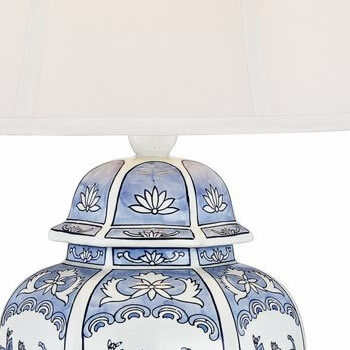 An off-white square bell shade sits on top. 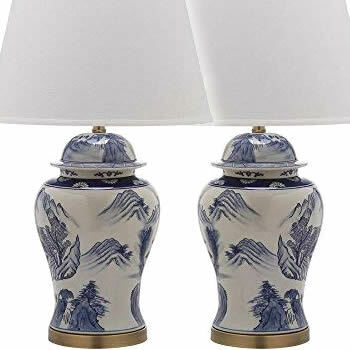 This is a set of two table lamps. 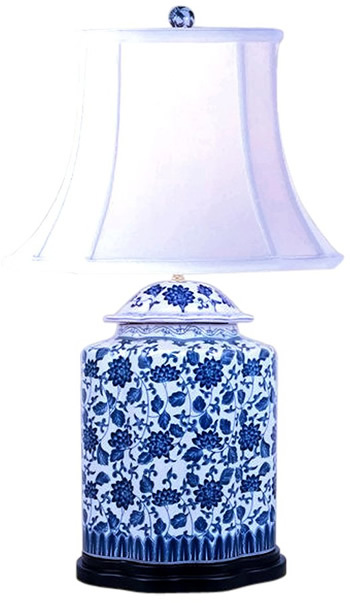 Adorned with the classic double happiness symbol, the blue and white floral Abbie table lamp looks chic and new with an acrylic pedestal and finial and textured white cotton shade. 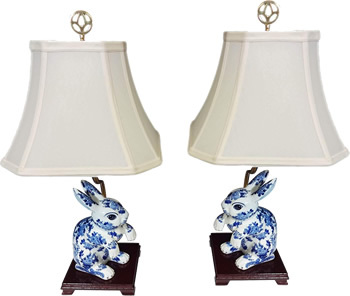 Artfully crafted of glazed ceramic, this set of two shines in any setting. 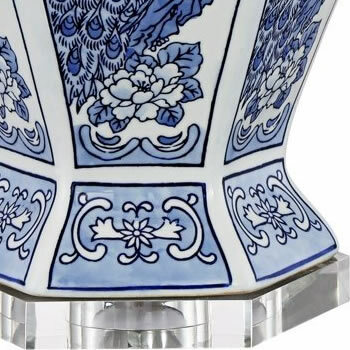 The charm of Décor Therapy's Blue and White Ceramic Table is instantly appreciated. 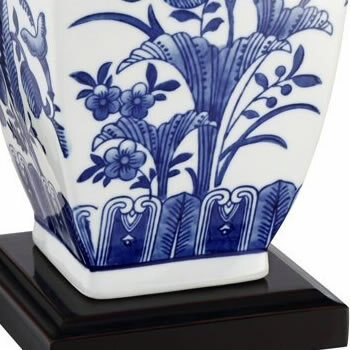 The ceramic base features a chic combination of Blue and White in an elegant pattern, adding both design and color to your side table or night stand. 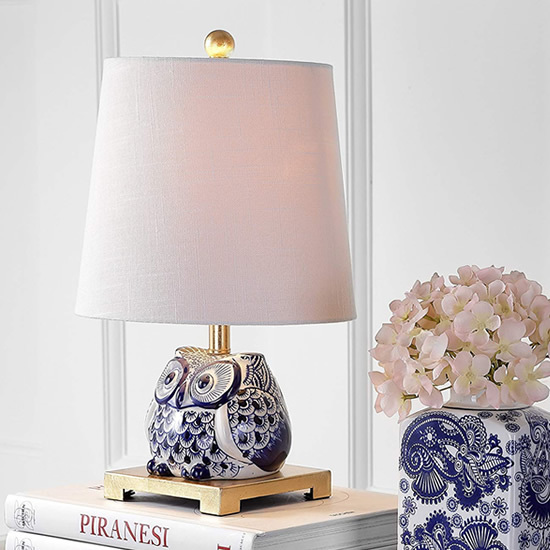 The crisp white cotton hardback shade accents the pattern. 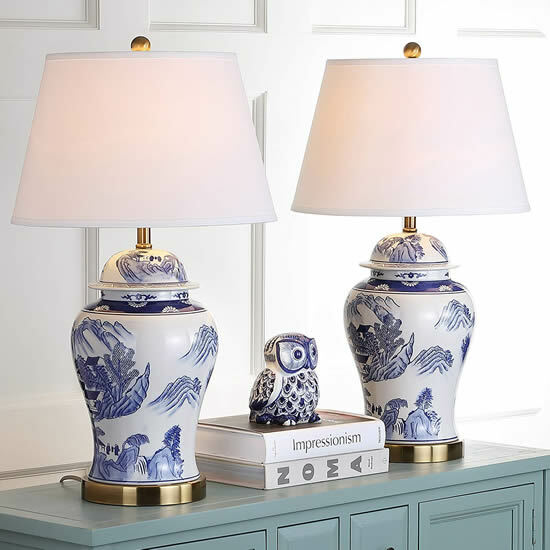 Height 28" x Width 16"
Artfully crafted of glazed ceramic, this set of two Asian inspired table lamps are the perfect touch for any setting. 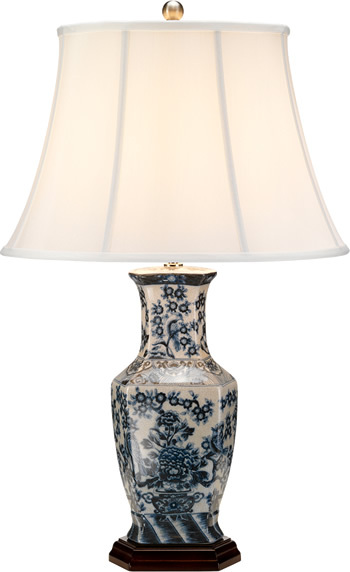 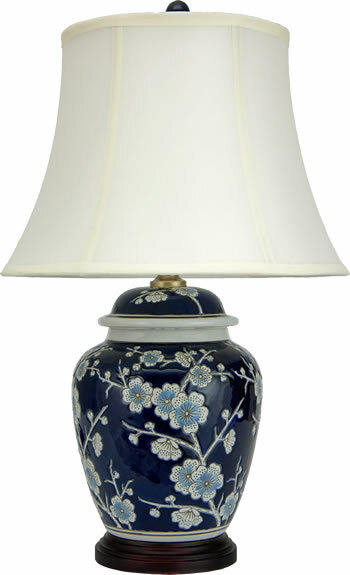 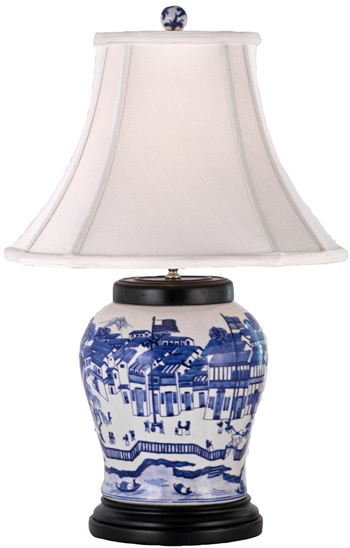 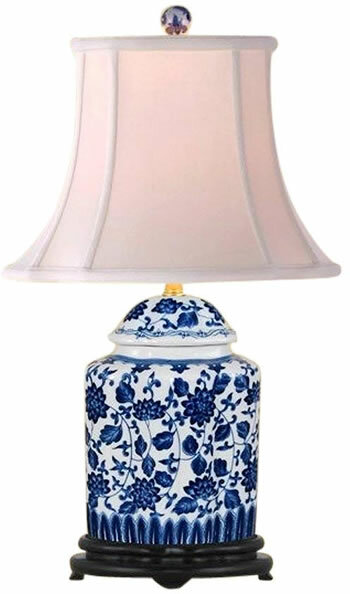 This ceramic lamp features an exclusive Barnes and Ivy cobalt blue and white floral pattern. 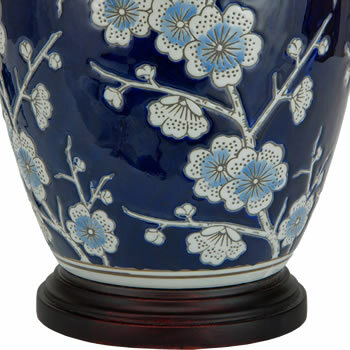 The blooming floral design evokes a sense of spring and renewal making it the perfect addition to a side table in any room in your home. 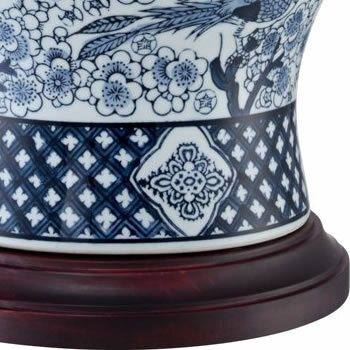 The darker finish on the base, neck and finial completes the look. 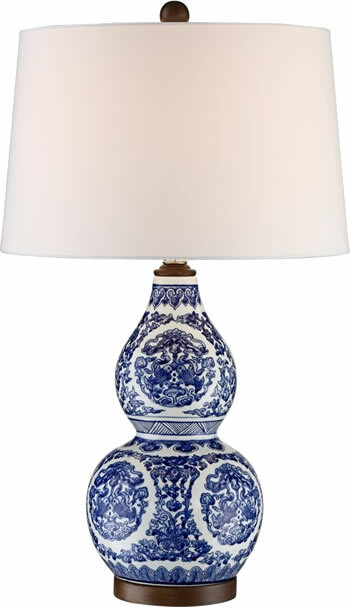 The Iris Asian-inspired blue and white ceramic table lamp is a timeless style, perfect for completing your traditional home or accenting a farmhouse, eclectic or country interior. 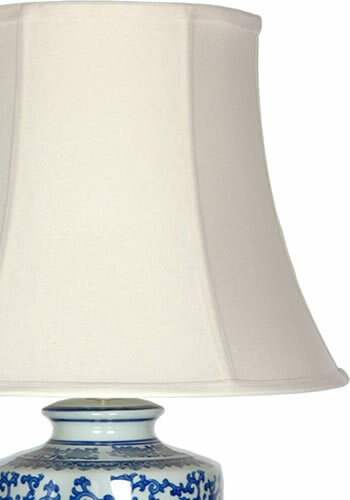 The lamp's classic design is topped by a Geneva white drum shade, lending a more contemporary element. 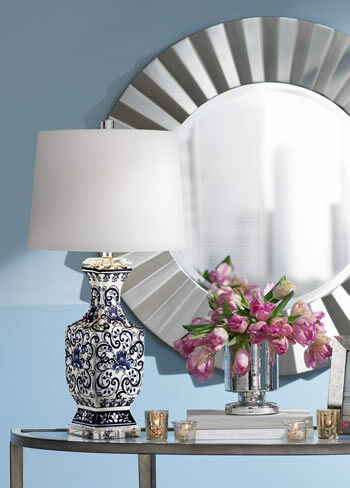 The crystal accents add a touch of glamour. 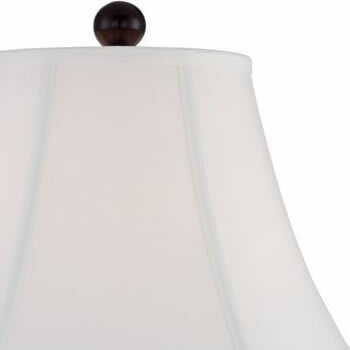 It has an 8' clear cord. 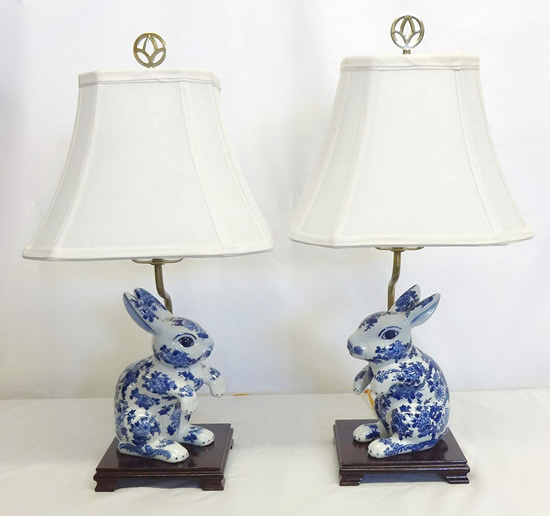 Height 12" x Width 6"
Turn your love of bunnies into a focal point in your home with this pair of bunny lamps. 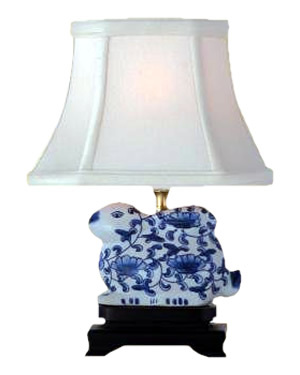 Porcelain bunny figurines sit atop brown bases to form the lamp, with a durable, stable design. 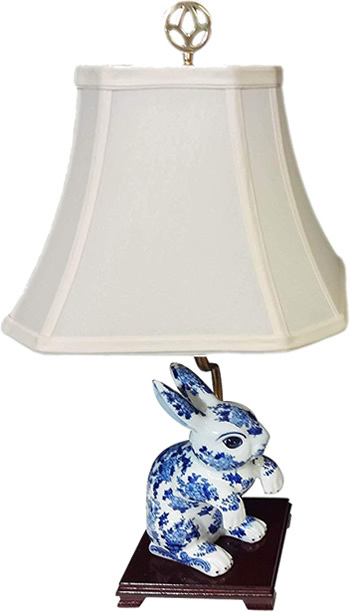 Bunny figurine base made of durable porcelain with a smooth finish. 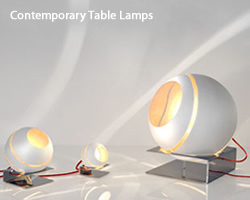 Each table lamp uses a 100-watt light bulb. 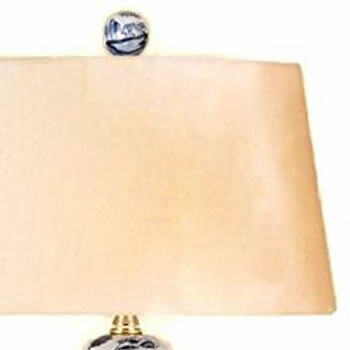 Shade is made of silk fabric. 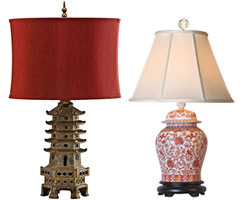 Lamps are UL listed for safety. 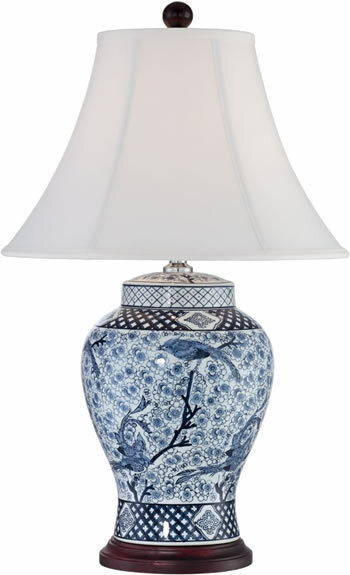 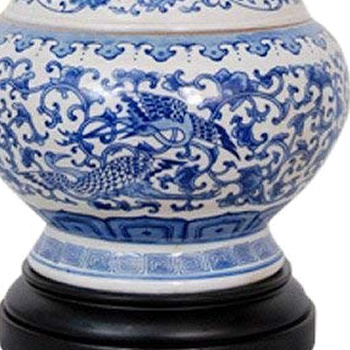 Lamp: 19" Tall x 16" x 11"
This Oriental blue and white ceramic table lamp has a traditional phoenix pattern. 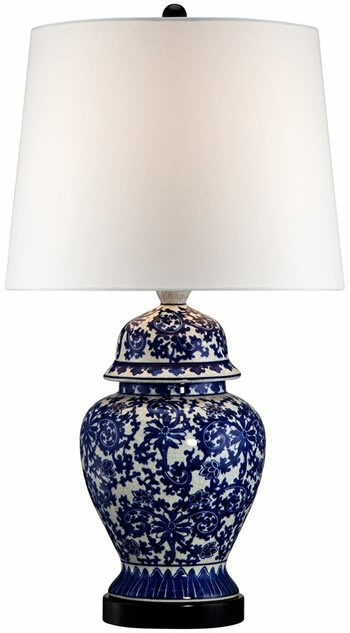 The 21.5" height is ideal for your bed side or anywhere you want the classic look of traditional blue and white. 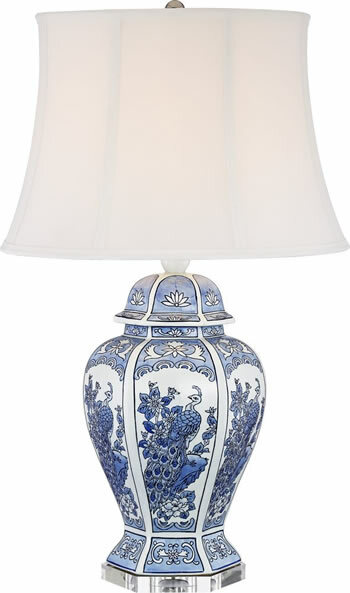 A visually stunning table lamp in a jar shape with a delicate floral vine design in a rich blue and white color pattern, adds an antique-inspired look. 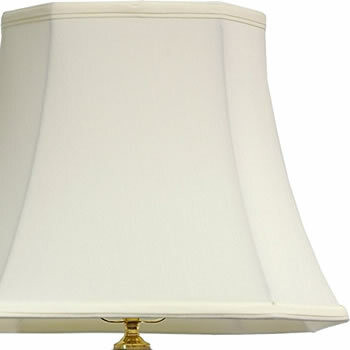 While the drum white lamp shade will complement any style decor. 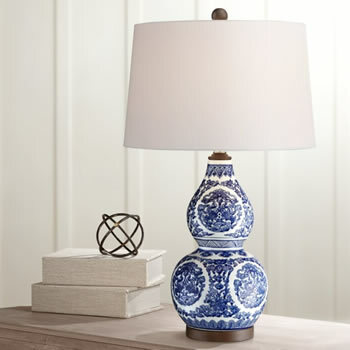 A wood base completes the look. 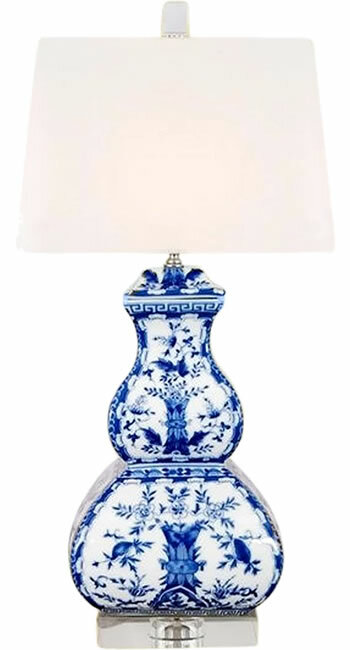 Though inspired by fine china, this scalloped tea jar table lamp - blue and white isn't your mother's lamp with its elegant style. 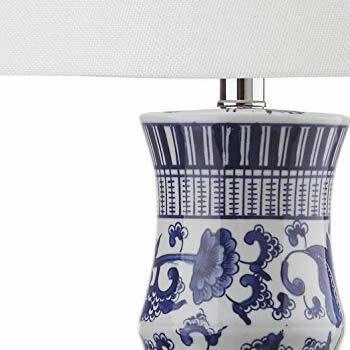 This porcelain lamp is expertly painted in bold hues of blue and white. 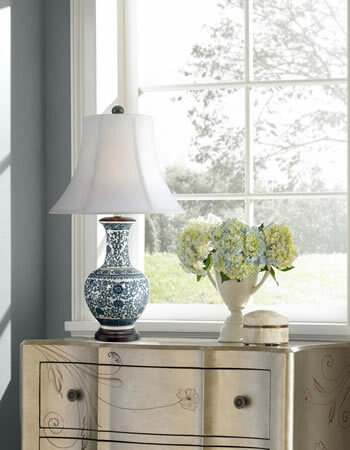 The curving bell shade is topped with a ball finial to perfectly finish out the look. 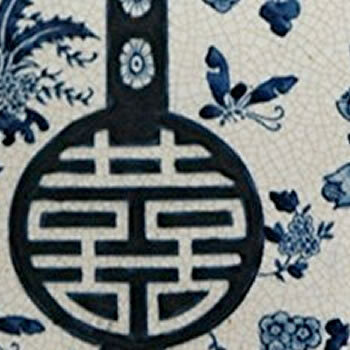 Lasting porcelain construction. 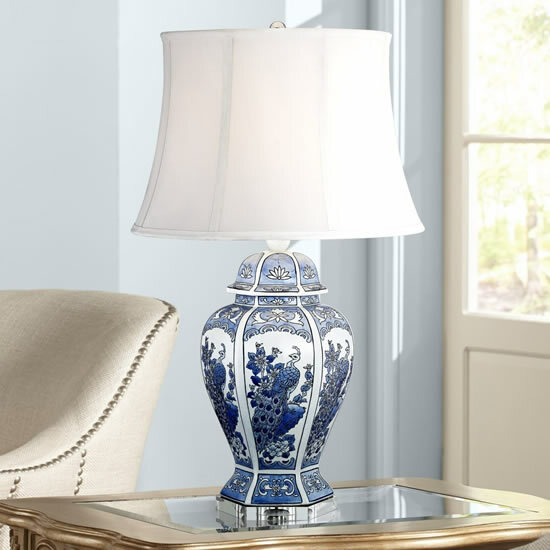 Elegant hand-painted finish in blue and white. 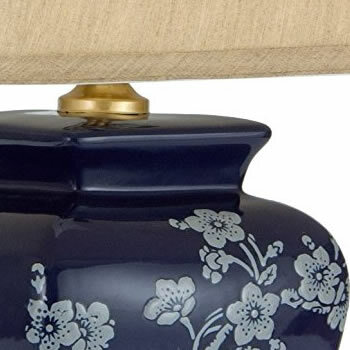 Curving bell shade. 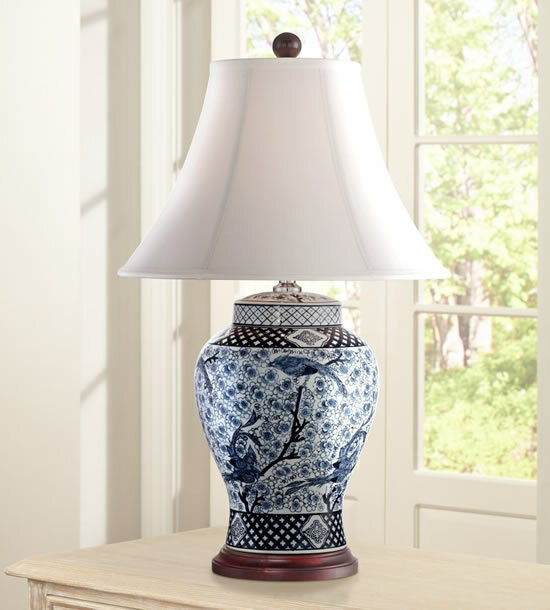 This elegantly hand-crafted porcelain lamp features a traditional Ming blue and off-white landscape pattern with pagoda and tree detail. 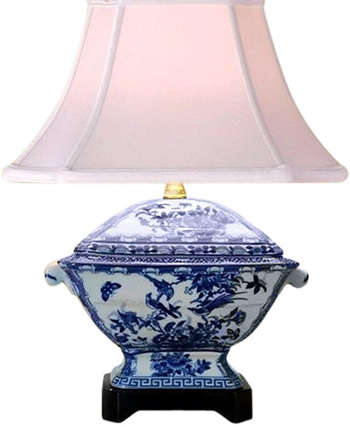 The white sateen lampshade shown is included. 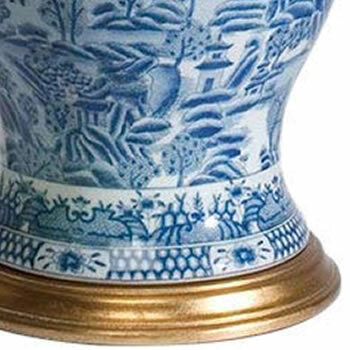 The textured glaze is not true white. 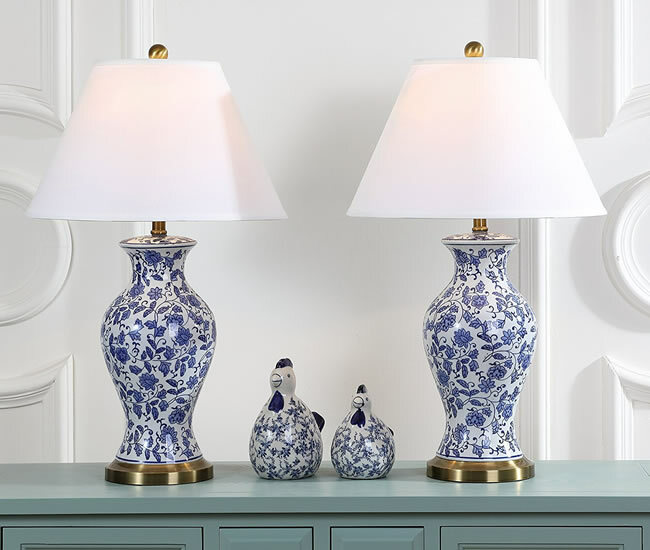 Inspired by traditional Japanese design, this breathtaking porcelain lamp features a bold composition and a rich blue glaze. 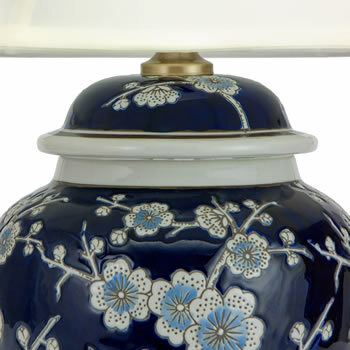 Branches laden with cherry blossoms rise from the base of the lamp, their pale blue design standing out vividly against the deep cobalt background. 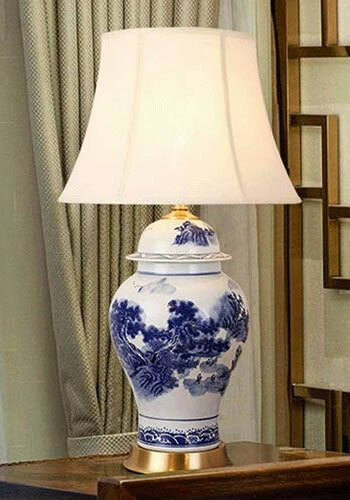 The tan lampshade complements and enhances the colors of the lamp, creating a harmonious design that will add a sophisticated Asian accent to any room. 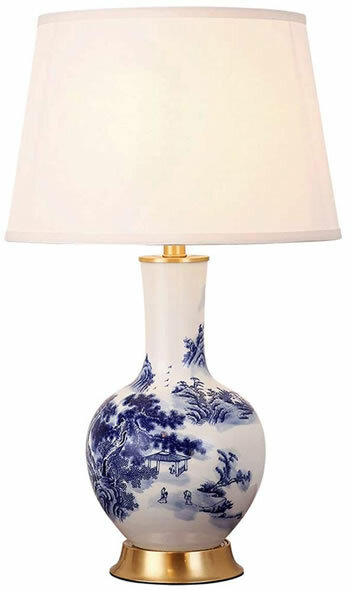 This porcelain lamp is in an imperial "moon vase" design, a pattern popular in both Qing and Ming period decor. 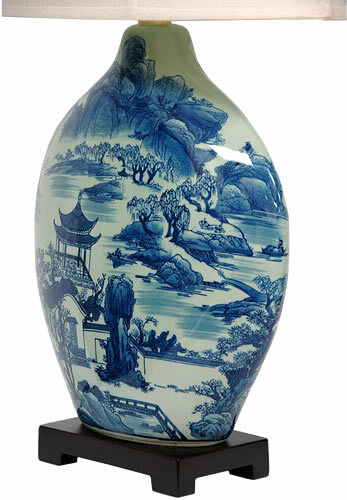 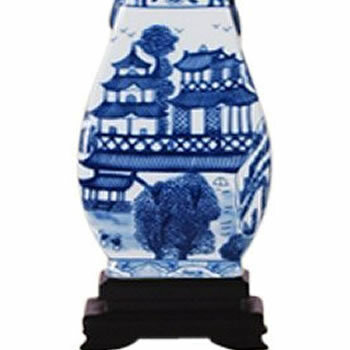 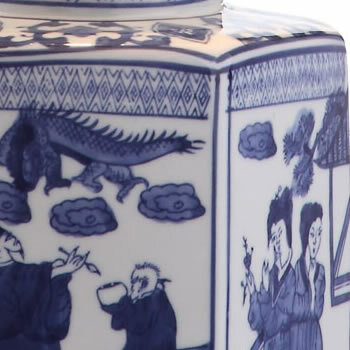 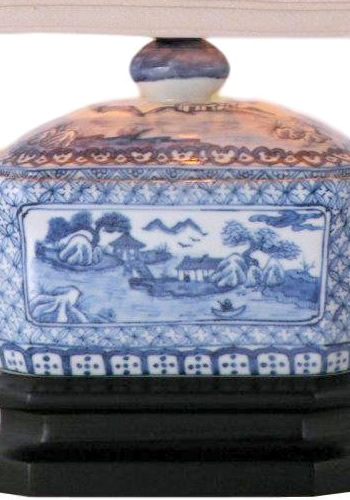 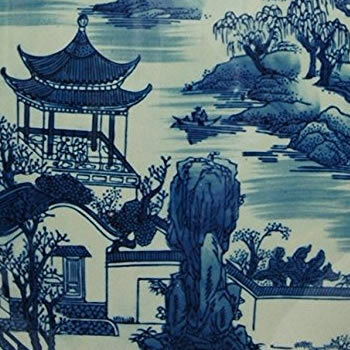 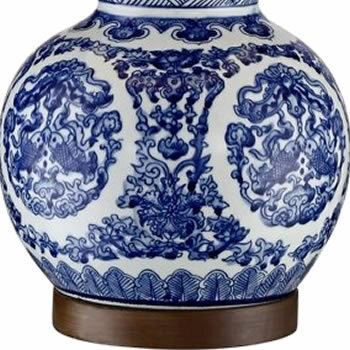 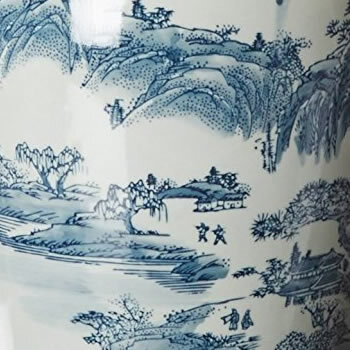 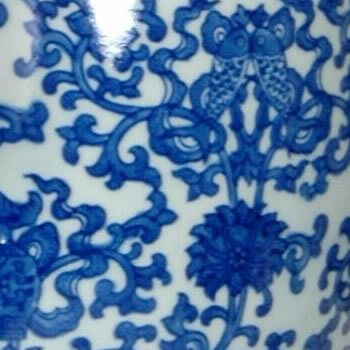 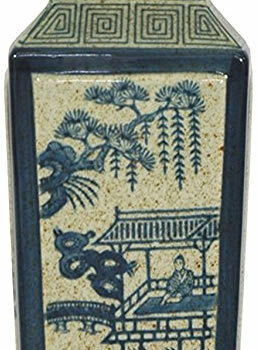 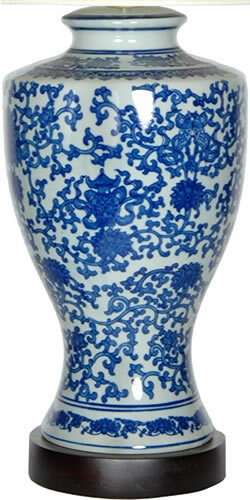 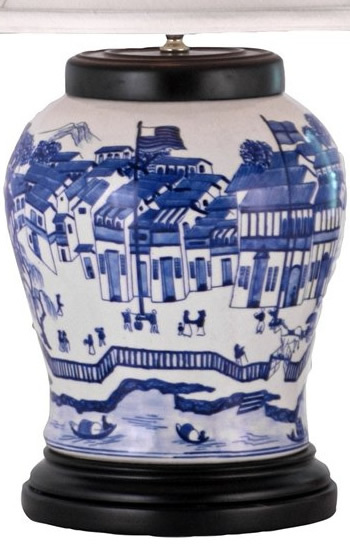 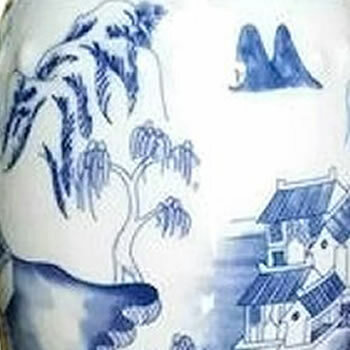 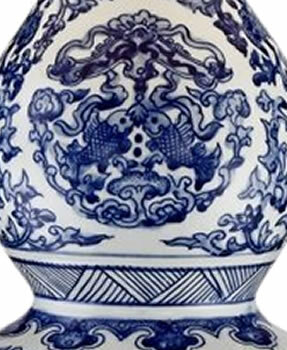 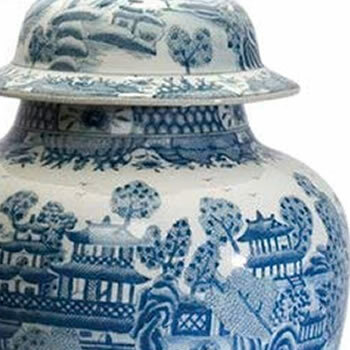 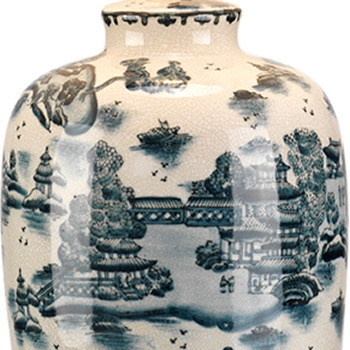 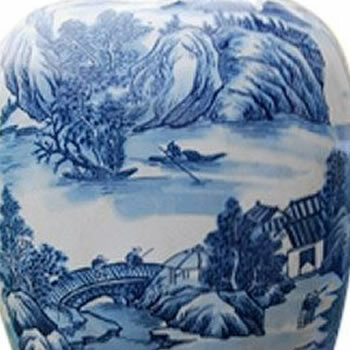 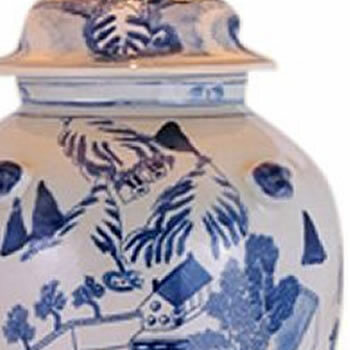 It features a traditional Ming blue and white landscape pattern with pagoda and tree fine detail. 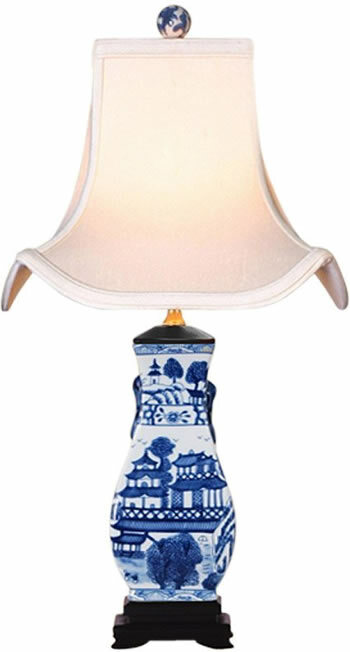 The sateen lampshade shown is included. 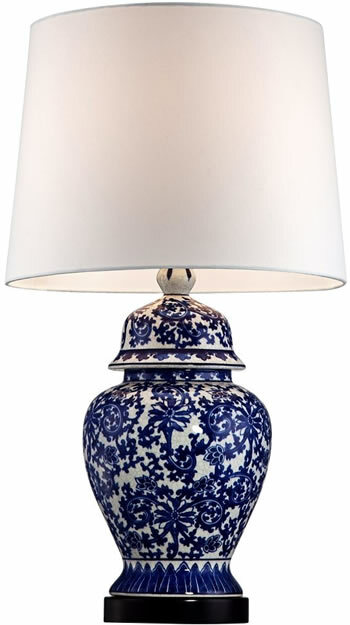 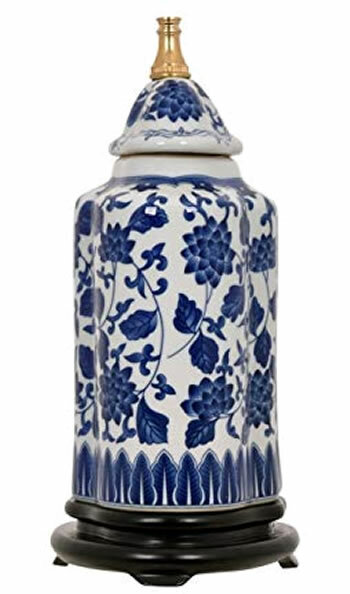 This classic urn shaped porcelain lamp features a chinese coriander blue scrolling floral print in a traditional Tamarind pattern on a bright white background. 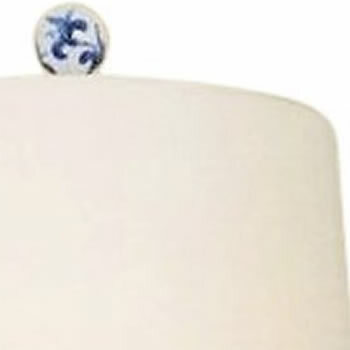 The vitreous porcelain ceramic lamp has an ivory fabric bell shade. 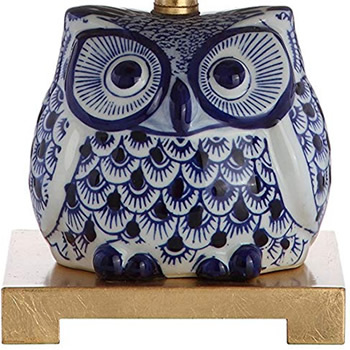 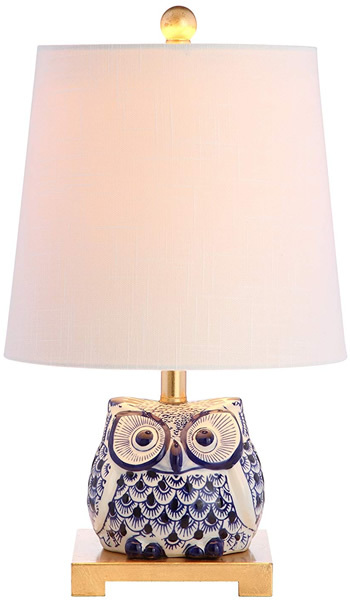 For a touch of woodland whimsy, this charming owl table lamp delivers a fun accent. 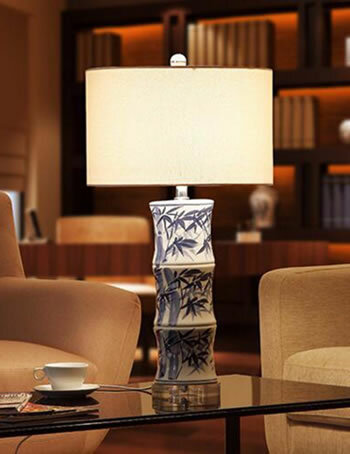 The ceramic base was cast using a mold from the midcentury archives, refined to suit the scale and simplified details preferred in contemporary lighting today. 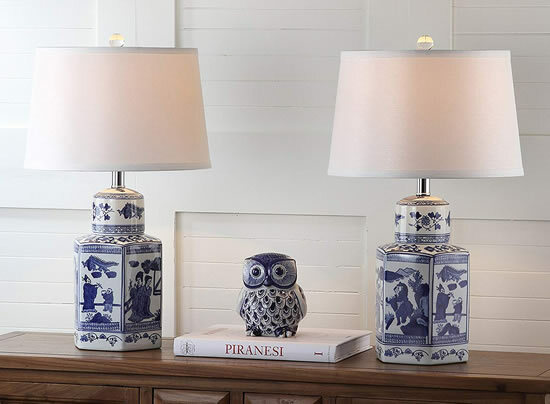 Whether adding a conversation-worthy lighting feature to an otherwise serious room, or joining a menagerie of collected animal-inspired home decor items, this owl table lamp promises to simultaneously blend in with your palette and stand out with its cheeky silhouette, no matter how you style it. 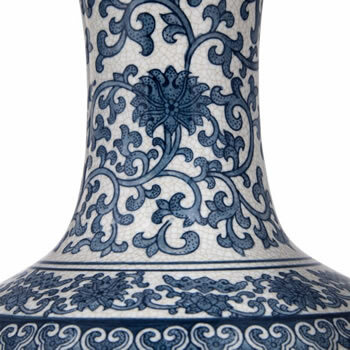 Elegantly hand-crafted by artisans in China's Guangdong province, this beautiful piece combines a Song dynasty style porcelain vase with a carved wooden base. 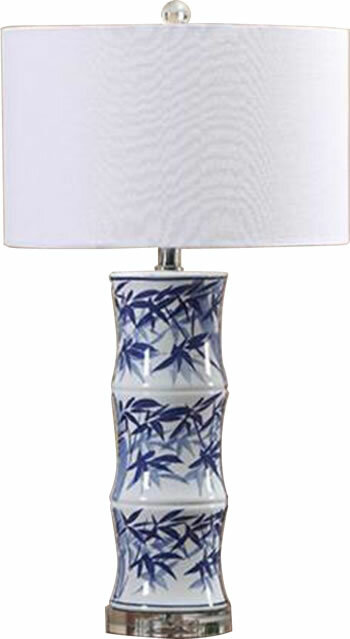 The porcelain part of the lamp features a textured glaze sure to add a colorful accent to any room. 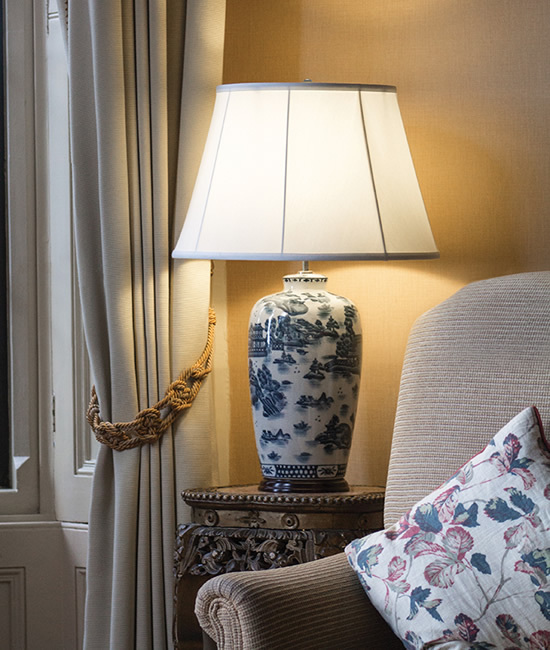 A fabric shade on a steel frame completes the design. 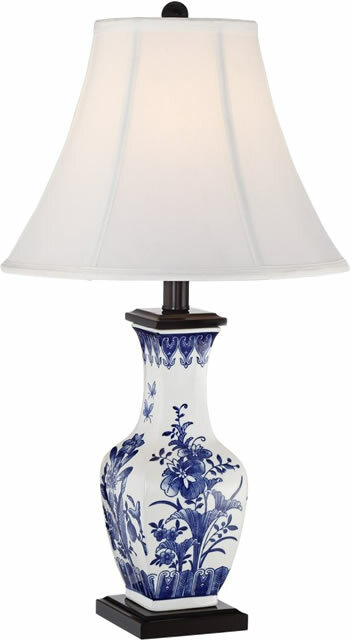 This porcelain lamp features a three-way light fixture that uses up to a 100 watt bulb and includes a soft hand made shade. 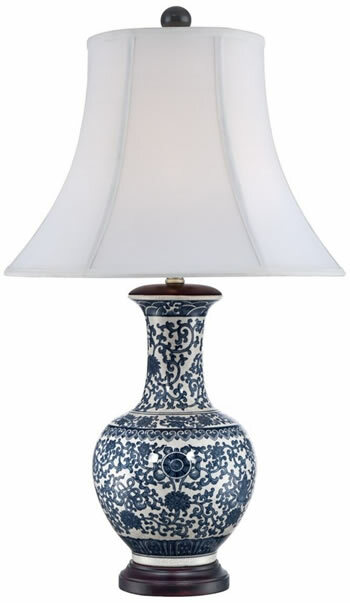 This traditional oriental lamp features an authentic Asian vase body decorated with a finely detailed Ming blue and white landscape pattern. 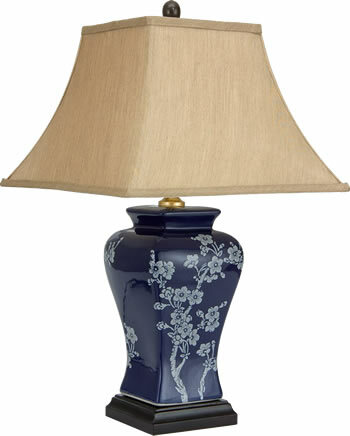 It has a dark rosewood cap and base. 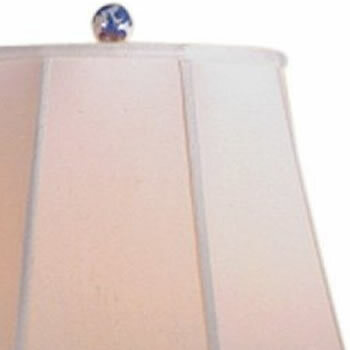 The included pleated lampshade is white. 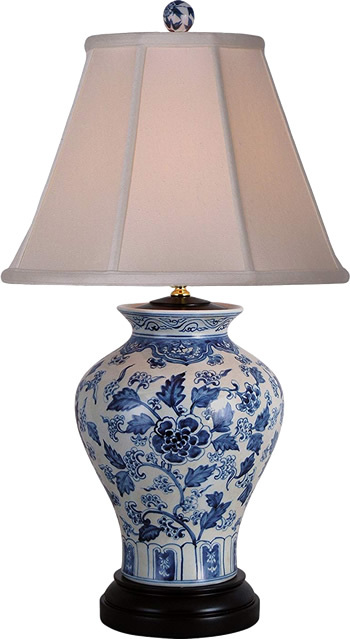 Complete Height with Shade: 28"
Height 12" x Top Width 12" x Bottom Width 18"
Complete Height with Shade: 27.5"
The Windom Chinoiserie-inspired blue and white ceramic table lamp is a timeless style, perfect for completing any traditional home. 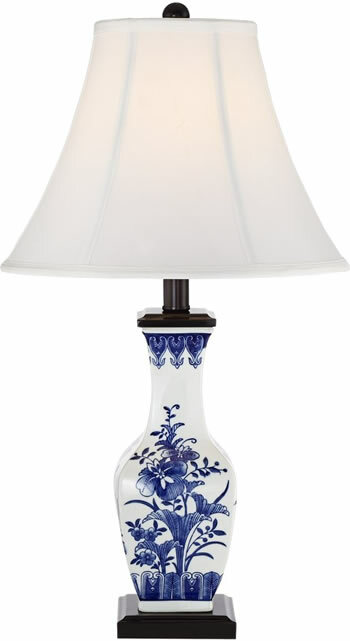 The lamp's classic design is topped by a white bell shade and decorative finial. 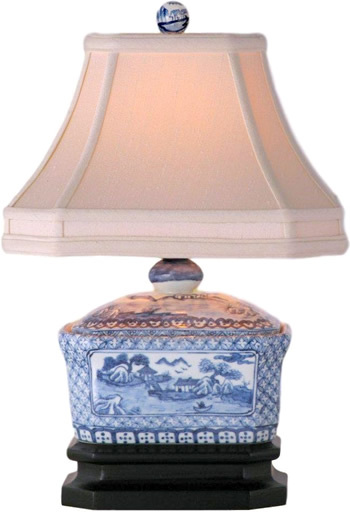 This Oriental blue and white ceramic table lamp is a traditional choice to complete your traditional of farmhouse style home. 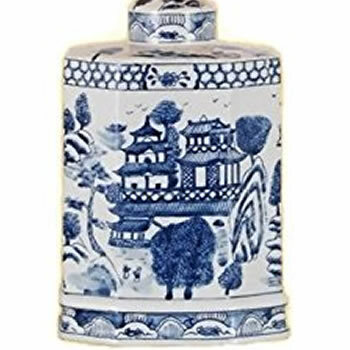 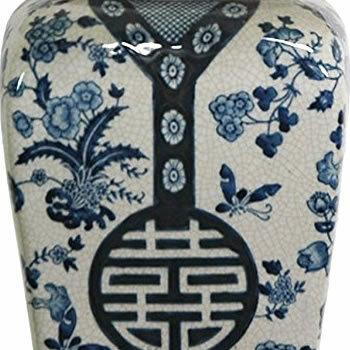 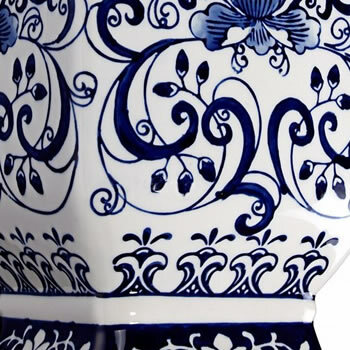 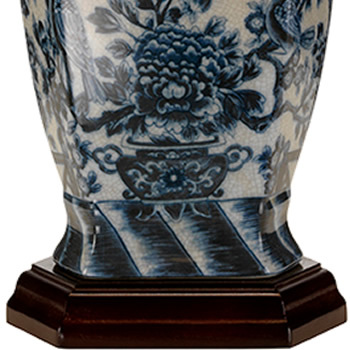 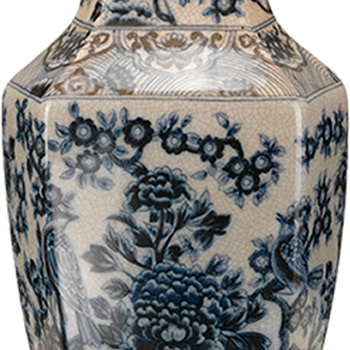 The hand decorated porcelain ginger jar base is decorated with a traditional Chinese stylized blue and white crysanthemum floral pattern. 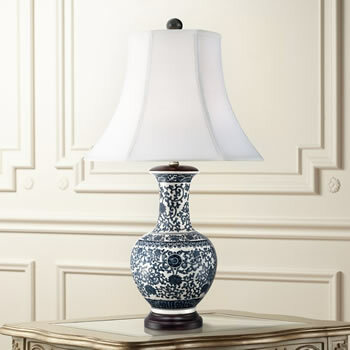 The white drum shade and black base and finial give it a more contemporary aesthetic. 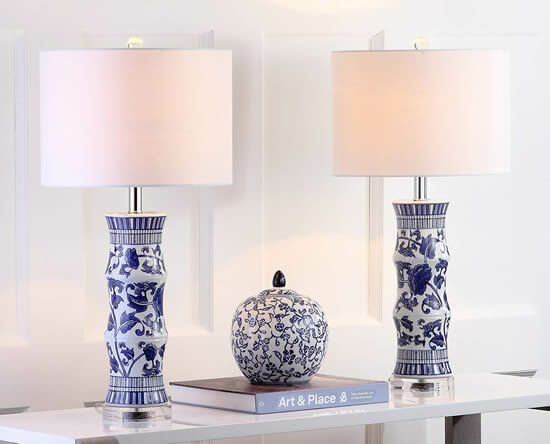 Inspired by an antique beaker vase, this is a set of two blue and white ceramic Sandy Chinese Style Table Lamps. 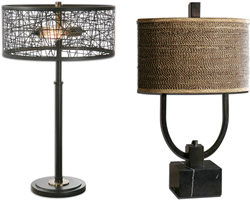 Each is banded with an intricate stripe motif for striking contrast. 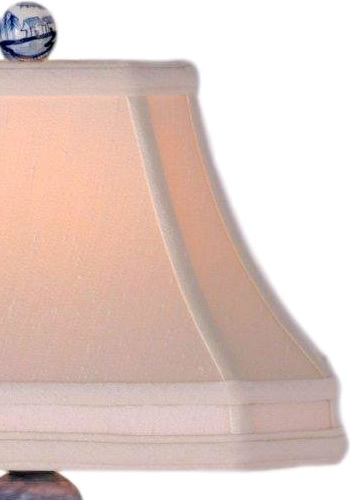 A textured white cotton drum shade and acrylic pedestal and finial update a timeless classic look. 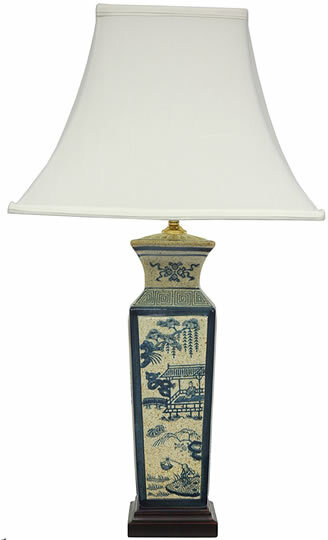 This Oriental blue and white ceramic table lamp has a pattern of bamboo hand painted on the white column body. 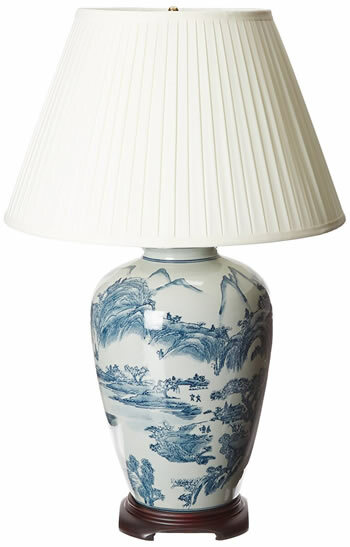 This Oriental blue and white ceramic table lamp has a landscape pattern reminiscent of blue willow china in a traditional toile pattern. 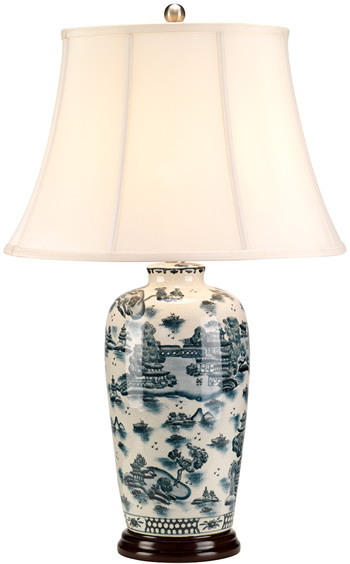 The 27" height is ideal for your living room or anywhere you want to introduce the clean white look of traditional Asian transferware. 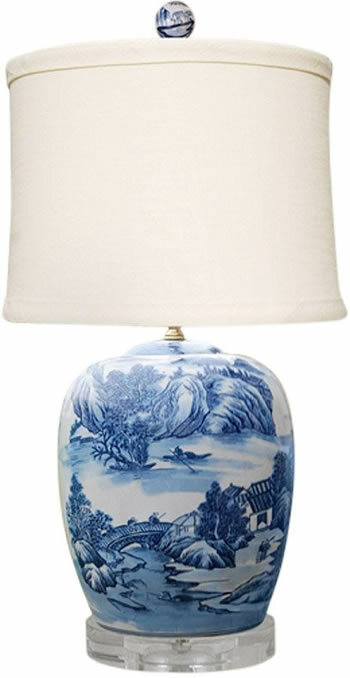 This hand-painted Oriental blue and white ceramic table lamp is decorated with a traditional Blue Willow pattern. 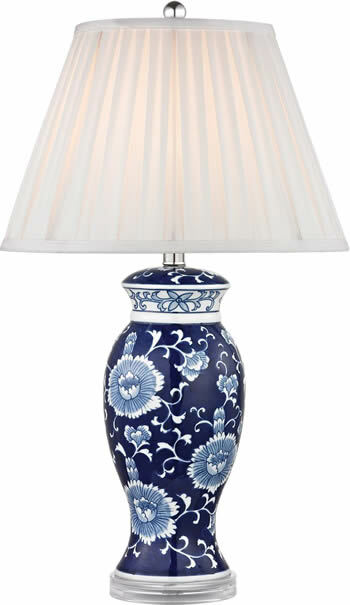 The smaller 16" height is the perfect size to enhance your home. 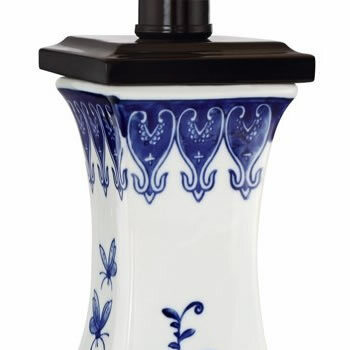 Ideal to fit on shelves or on a kitchen countertop. 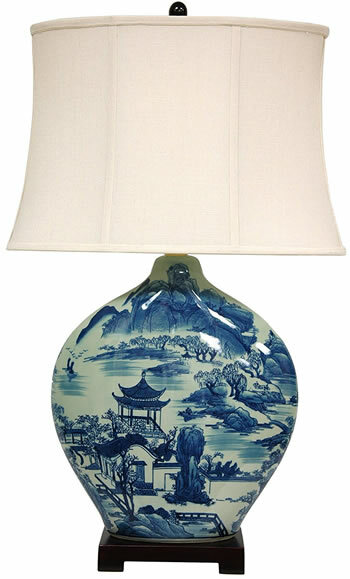 This Oriental blue and white ceramic table lamp has a large scale Asian landscape pattern. 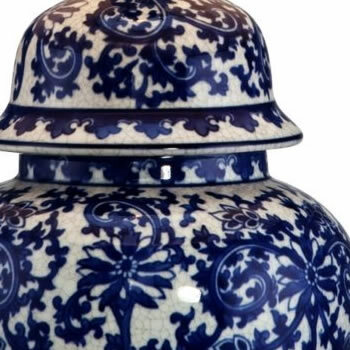 The smaller 19" height is ideal for a bedroom or anywhere you want to introduce the clean white look of traditional Asian transferware. 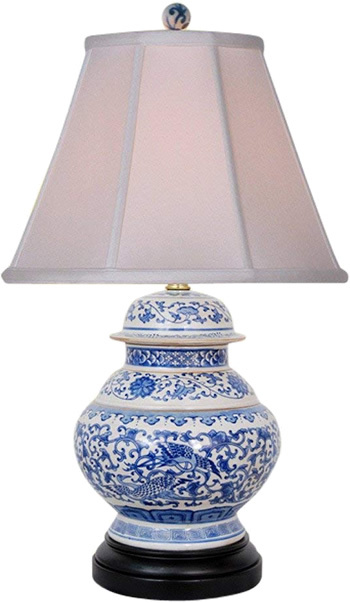 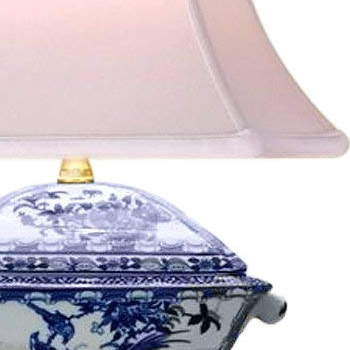 This highly stylized Chinese blue and white porcelain table lamp has a traditional Chinese scene applied. 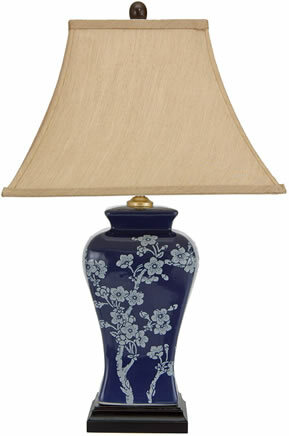 The smaller 22" table lamp has a square dark finished base. 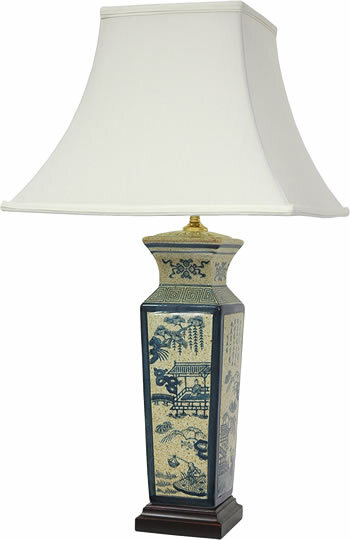 This large Oriental blue and white porcelain table lamp has a traditional Chinese scene on the body and finial. 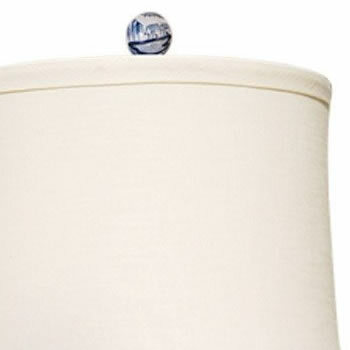 The 33" height makes an important statement in your living room. 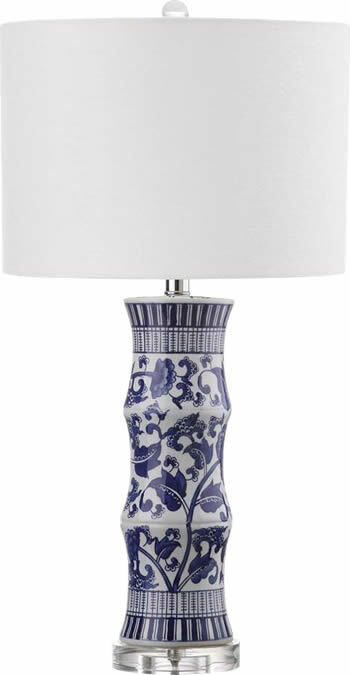 This ceramic lamp features an exclusive Barnes and Ivy pattern drawn from the paradise designs and murals of India. 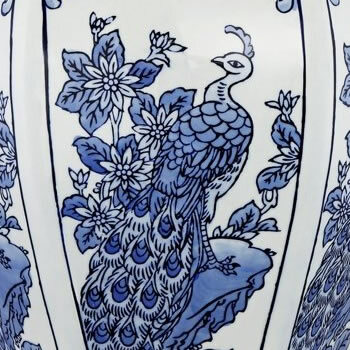 Each panel is features a scene with a stylized floral garden and peacocks. 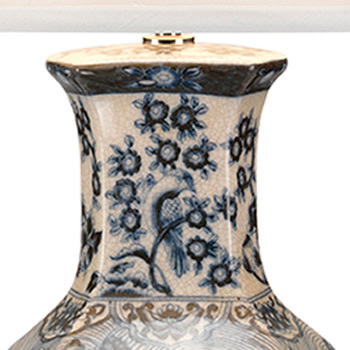 14" across the top, 16" across the bottom, 10" high. 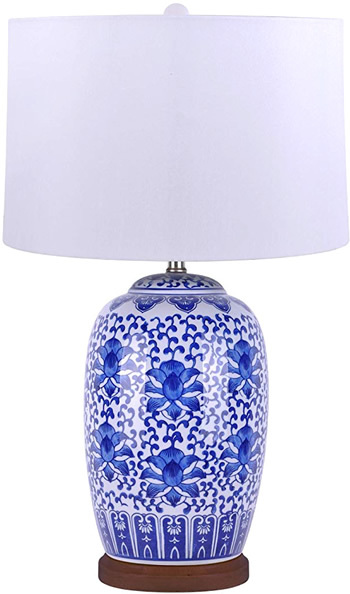 Featuring an elegant double gourd body, this blue and white ceramic table lamp boasts design of rich foliage and swirls in a traditional Tamarind pattern. 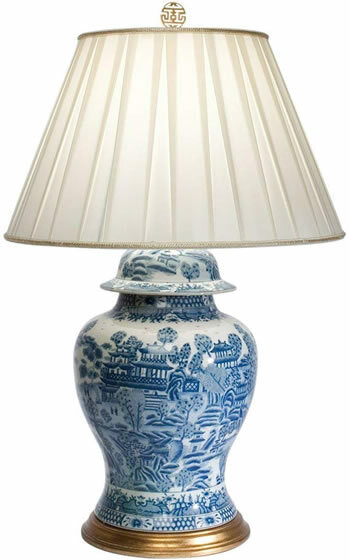 The table lamp is completed with a handsome contemporary drum shade. 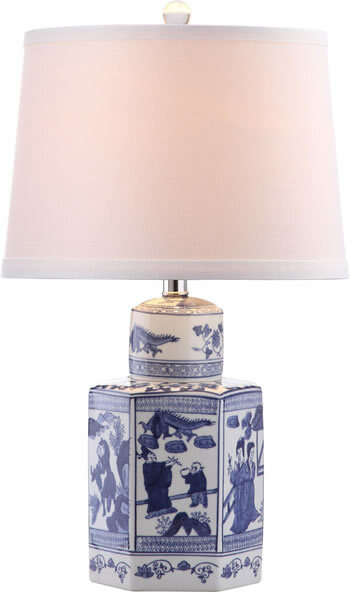 Traditional Japanese takes a fun and modern twist this beautiful jar table lamp in a pattern exclusive to Barnes and Ivy. 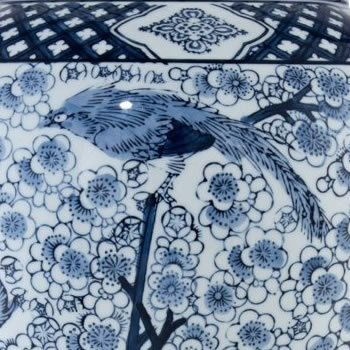 Accented with a blue and white bird, cherry branch and cherry blossoms motif are bracketed by scroll geometric details at the top and bottom. 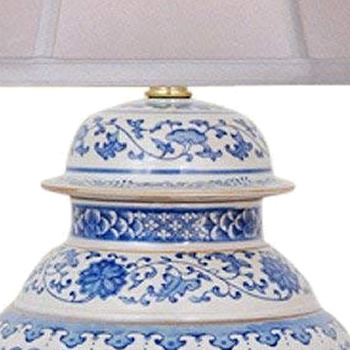 A white bell shade sits on top. 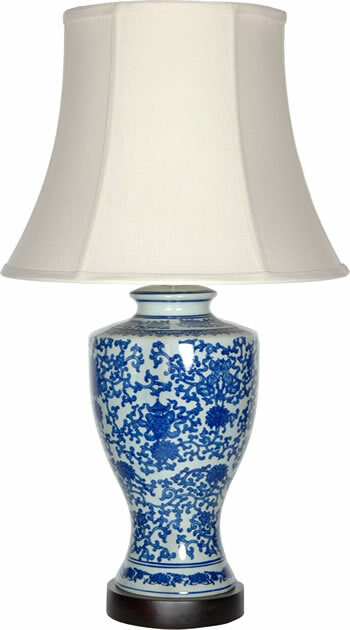 Shade dimensions: Shade height 14" x Shade top 12" x Shade bottom 22"
Blue, white, and handsome. 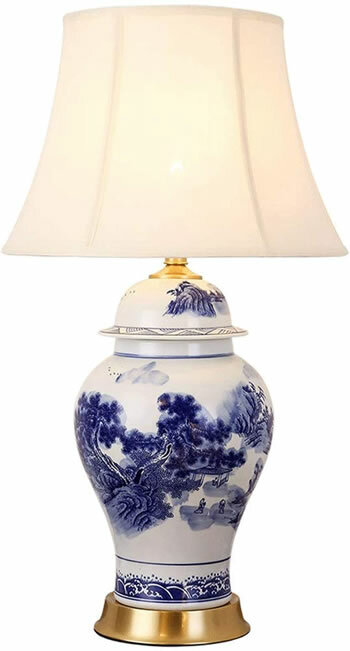 Our dramatically scaled Chinese porcelain lamp in a traditional ginger jar format painted by hand. 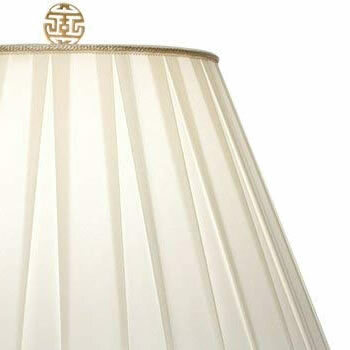 Set on an antiqued gold-leaf base, it's paired with a cream box-pleated softback shade, conveying worldliness and sophistication. 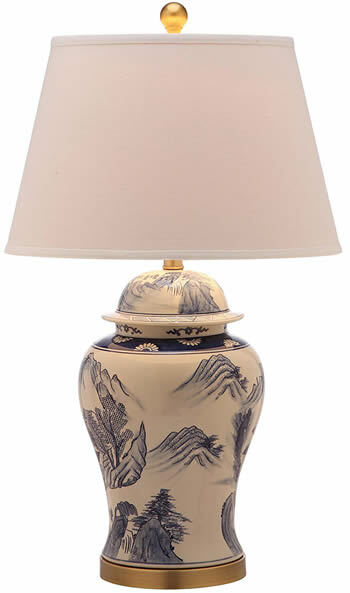 Inspired by antique Chinese pottery depicting mountain and forest scenes, the Shanghai Ginger Jar Blue Willow Chinoiserie Lamp is in keeping with fashion's renewed reverence for Asian design. 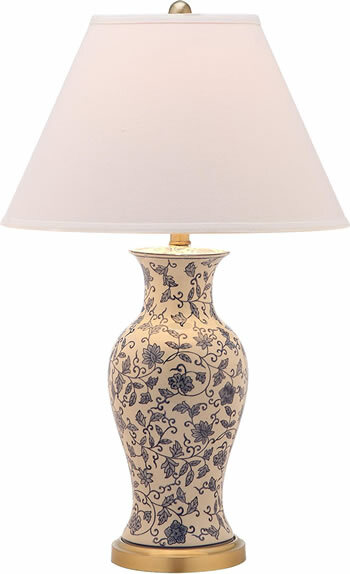 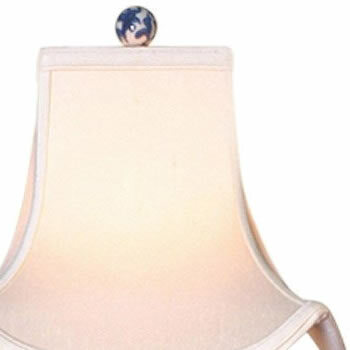 This classic lamp is crafted of ceramic with white linen shade and antique gold accents. 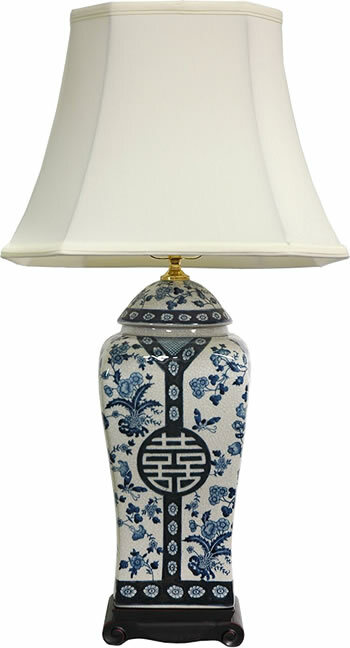 This Oriental blue and white ceramic table lamp has a landscape pattern hand painted. 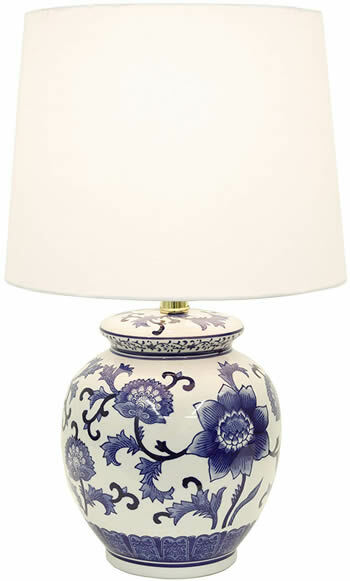 Wandering flowers and vines adorn this pair of Beijing floral urn lamps, a classic Chinoiserie style in blue and white. 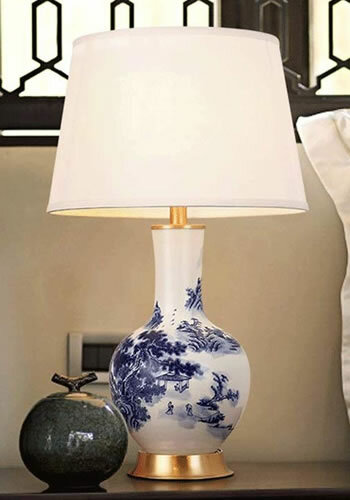 Crafted of glazed ceramic and accented with an antique gold base and neck, this artful lamp casts a warm, alluring glow in traditional rooms.